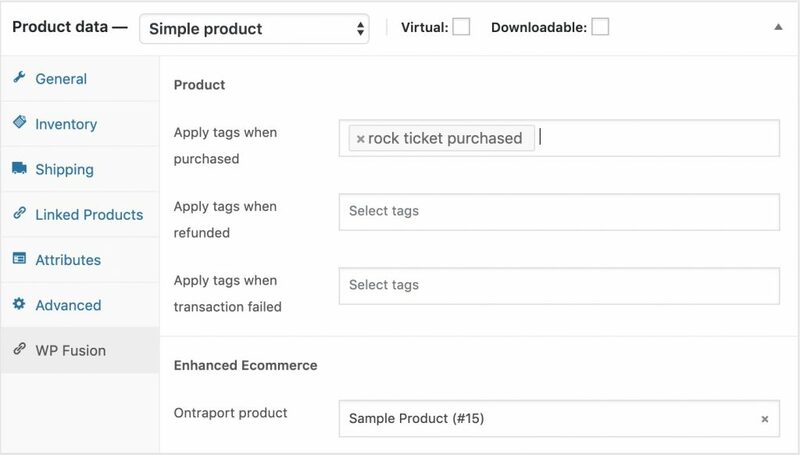 WP Fusion already connects your ecommerce platform to your CRM, allowing you to create contacts and apply tags when products are purchased, but only contact data is transferred, not the transaction details for each purchase. Our Ecommerce Addon, available to Plus and Professional license holders, builds on this functionality by letting you create separate order records in your CRMs ecommerce platform, including products purchased, coupons and discounts used, shipping, and taxes. Using this addon you can keep track of ecommerce data in your CRM alongside each contact record, allowing for greater flexibility in creating campaigns and automations, as well as using your CRMs reporting tools to monitor your sales performance. When a customer checks out, WP Fusion will create an order record and send it to your CRM. If your CRM supports products WP Fusion will also create new product records and add them to the order. This addon currently works with Infusionsoft, ActiveCampaign, Ontraport, AgileCRM, HubSpot and Drip, but we’re planning to expand on this as our list of CRM integrations grow. The Ecommerce Addon will send enhanced ecommerce data for all orders, including support for products, variations, quantities, discounts, shipping, and taxes. In CRMs that have Products as separate entities from Orders, you can associate your WooCommerce products with CRM products by selecting them from the product dropdowns. Variable products can be associated within the individual variations. The Ecommerce Addon will send enhanced ecommerce data for all orders, including support for downloads, download price IDs, discounts, and taxes. In CRMs that have Products as separate entities from Orders, you can associate your EDD products with CRM products by selecting them from the product dropdown. The Ecommerce Addon will send enhanced ecommerce data for all purchases of access plans, including support for discounts. In CRMs that have Products as separate entities from Orders, you can associate your LifterLMS access plans with CRM products by selecting them from the product dropdown while editing the access plan.